In December of last year, I was invited by Z Publishing House to submit my writing for their America's Emerging Writers series. In keeping with the theme of Wisconsin, I submitted a piece that I wrote for my good friend Sydney Prall. As part of a college project, she was compiling a collection of songs and written pieces inspired by the waterways of Wisconsin. I wrote Stone Lake for that project. In June, I found out that my piece had been accepted, and now the anthology is available for pre-order. 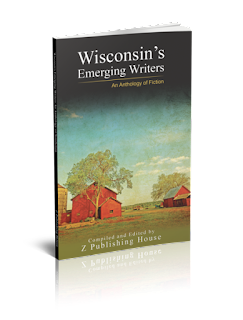 Here's some copy from the product page: "In Wisconsin's Emerging Writers: An Anthology of Fiction, Wisconsin's most promising up-and-coming authors have the chance to share their own words. Covering a wide array of genres ranging from literary fiction to satire, mystery, comedy, science fiction, and more, these young talents will amaze you. Containing one story per writer, this anthology is a compelling introduction to the great wordsmiths of tomorrow." Some of you may have followed this blog and my publication journey for quite some time. My first posts on this site go back nearly a decade. It's been an interesting journey, with several awards won and contracts signed, only to ultimately end up dissolving as time passed. I decided to take some time off from trying to get one of my novels published and got my bachelors degree from UW Madison—Communications, Digital Studies, and (of course) English with an Emphasis in Creative Writing. If you'd like to hear my piece for the Wisconsin's Emerging Writers series, feel free to listen to the reading I did for Sydney's project. And if you like it, feel free to listen to the other pieces from the Wisconsin Waterways demo.